In a Collector's Edition entitled "Secrets of the Da Vinci Code," published by US News and World Report, there is a brief interview with James Robinson, general editor of the Nag Hammadi Library. 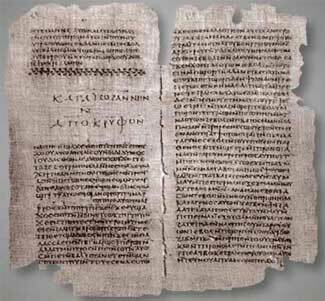 Amazingly, whatever the significance of their content (and we have just barely begun to comprehend what that might be), the Nag Hammadi Codices (NHC) are rare original artifacts, the earliest surviving examples of bound books. A close reading of these arcane materials shows that Gnostics were deeply concerned with alien intrusion into human affairs. The entities they called Archons appear to be identical to the ET’s of modern Ufology. Both Grey and Reptilian types are explicitly described in the codices. I would estimate that up to one-fifth of the core material in the NHC concerns the Archons, their origin, methods and motives. This startling line alludes to the Gnostic theory that the solar system was produced by the impact of the goddess Sophia upon lifeless atomic matter, but the Earth was formed from Sophia’s divine, alive, self-aware power. Odd as it sounds, this view is totally compatible with modern astronomy. We know that the solar system at large is dominated by inorganic chemistry and does not support life as it occurs in the biosphere, where organic chemistry is the norm. Gnostics would argue that this is so because the Earth is the embodiment of Sophia, while the solar system is the product and habitat of the Archons. The observation of this difference between the inorganic and organic aspects of our solar system led James Lovelock to formulate the Gaia Hypothesis. So, the earliest surviving books contain a description of Alien intrusion, but what about the earliest known writings? Archeologists tell us that cuneiform writing was invented in Mesopotamia around 3200. The cuneiform record gives us the most extensive repertoire of stories about human prehistory. Cuneiform texts such as Atrahasis, Enuma Elish, and Enki and World Order, present stories of a non-human race called the Annunaki, “those who from heaven to earth came,” as Zecharia Sitchin translates that term. Sitchin is known for densely researched books on the Annunaki, whom he identifies with the Biblical Nefhilim, “the Watchers” of the Book of Enoch. These are alien entities who “came into the daughters of men,” as Genesis says. The story of the Annunaki describes how an alien race intervenes deeply in human evolution. Sitchin and others accept this plot as if it were an actual record of events in prehistory. Cuneiform tablets describe how two Annunaki leaders, Enki and his half-sister Ninhursag, produced a hybrid, slave race from the indigenous ape-like peoples of the planet. Hence, an alien “interbreeding program” is central to the Annunaki narrative. It is an indisputable fact that this story is written down in the oldest surviving records, but is the story itself a fact? However, there is a world of difference in the way the story is treated in these two sources. The cuneiform record tells the intervention scenario as if it were (pre)historical fact, a set of events that really happened. In the NHC, the story of the Annunaki (Archons) is introduced in a cosmological perspective, and then it is analyzed. In other words, the Gnostics had a view of the cosmic origins of the Annunaki, and they also took a critical approach to intervention. This is one of several NHC passages that show Eve outwitting the Archons. It presents a mythological event, and comments on the outcome of that event. In the Gnostic view, the Archon/Annunaki do attempt to interbreed with humanity, but fail. Other texts describe how Eve leaves her “phantom image” which the Archons defile, but they are unable to actually access her body, i.e., human genetic structure. The “Reptilian Agenda” is a modern interpretation and extension of the Sumerian cuneiform story, but it ignores the Gnostic version of that story, and the critical commentary. Sitchin’s weak points are his inability to present a convincing case for the origin and motives of the Annunaki, and his failure (or refusal) to describe their physical appearance. Most ET theorists who follow him assume the Annunaki are Reptilians: for instance, R. A. Boulay in 'Flying Serpents and Dragons' (an excellent book, by the way, and more deeply researched than Sitchin in some ways). The entire Reptilian Agenda stands or falls on how we view the cuneiform accounts, the oldest version of the alien intrusion plot. But who wrote the cuneiform stories? The answer is, scribes in the service of the Sumerian theocrats. This answer is not complete, however, because scribes write things down, they do not originate what they write. Who then originated the cuneiform intervention stories taken down by scribes? I propose that it was soothsayers and advisors in the service of the theocrats. No ancient court was without a psychic channeller, if not a whole team of them. If we assume the critical distance of the Gnostics, we can understand how psychics advising the theocrats would produce a story to fit the need of their masters: specifically, the need to see themselves as descendents of “gods” and, at the same time, as slaves (albeit privileged ones) to a higher race that claims to have produced them. This message is schizophrenic, and as such it is totally consistent with channeled material and the mentality that produces it. If the cuneiform stories are the product of psychic channeling in ancient times, the Reptilian Agenda, the modern elaboration of those stories, needs to be entirely reexamined in the light of Gnostic Archon theory. The first step in confronting the Reptilian menace, whatever it is, is to set the story straight.